I consider myself food adventurous. Not in the same vein of Anthony Bourdain of the Travel Channel’s “No Reservations” or Andrew Zimmern of “Bizarre Foods” (warning: do not watch while eating), but I will try just about anything that doesn’t trigger my gag reflex. I do not chow down on crickets, tarantulas, head cheese or anything that’s still moving. I do, however, like to try new foods, particularly dishes from far off and exotic places like Thailand, Japan, China and India. Fusions involving two or more ethnic cuisines? Even better. I wasn’t always so willing to welcome foreign food onto my plate. I grew up in the ’70s on a rotating menu of pot roast, beef stew, canned salmon and tuna fish. Foreign food to us was a tin of Vienna sausages, jarred spaghetti sauce and boxed taco shells filled with ground beef simmered in McCormick’s mild taco mix. I lived a sheltered culinary existence, which is why I was reluctant to venture outside my food bubble until my early 20s when I dined with some friends at a Japanese restaurant. I was lured there by the promise of teriyaki chicken. My dining partners ordered an assortment of sushi. Ewww, I thought, how disgusting…raw fish. Isn’t that for bears? Eyes rolled when my bento box came and I was teased relentlessly until I consented to try a California roll. I was assured there was nothing raw lurking inside the seaweed and rice. I plunged my piece of sushi into a mixture of wasabi and soy sauce, shut my eyes, and popped it in my pie hole. I did not gag, and I got to finish the rest of my teriyaki in peace. A few days later I had a Sam-I-Am moment, something in my Vienna sausage-riddled brain had shifted. I was craving a California roll. Hey, I liked the sushi after all! And I would eat it on a train. And I would eat it in the rain … you get the picture. I wanted more. It took some time for me to work my way up to eating raw fish, and I will only eat sashimi and nigiri (see below) at sushi bars I trust, but I credit sushi–and my eye-rolling friends–for unlocking the door to the realm of foreign food. Today I have few friends who will follow me into the dining rooms of my favorite foreign food haunts. I think for most people–and it was this way for me–it’s hard to dive in when you’re intimidated by a menu of weird-sounding fare. This is where I come in. In the following months, I will walk you through different exotic cuisines and let you in on a few secrets. Whether you want to learn the basics or get some serious street cred with your foodie friends, this is your one-stop shop for exotic food advice. For my first installment, we will tackle sushi. Let’s start with some basics. 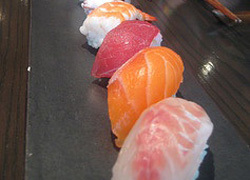 Raw fish comes in four forms: sashimi, nigiri, temaki and maki. Technically, sushi refers only to the rice used underneath the raw fish or inside the roll, but we Westerners tend to use the term to include everything on our plate. Raw fish by itself is called sashimi. This is usually not the first stop on the menu for beginners. 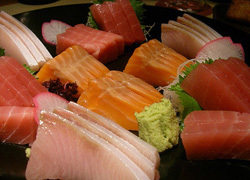 Hamachi (or yellowtail) and toro (aka fatty tuna) are popular types of sashimi. A good piece of toro is served paper thin, melts in your mouth and has a mild, fresh flavor. It’s quite heavenly done right. I order this only at well-established, higher-scale sushi restaurants. I wouldn’t order lobster at Denny’s and I wouldn’t order toro at a strip mall establishment that opened a month ago. Nigiri sushi consists of a small mound of sticky rice and a thinly sliced piece of raw fish held together by a strip of seaweed. If you are uncomfortable with raw fish, try the ebi (cooked shrimp), barbecue unagi (eel) or smoked sake (salmon) nigiri. Temaki is basically a cone of seaweed filled with various raw fish and their accoutrements. You’re on your own here since I’ve never ordered it or been with anyone who has. I would much rather have my fish wrapped up in a nice, neat roll. See the following paragraph. Insider tip: Buy your sushi chef a beer or sake. Although not expected, it’s appreciated and will often times get you better service. 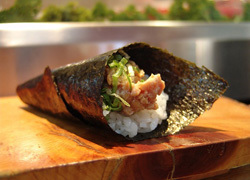 Maki sushi refers to the roll and is made up of seaweed (nori) wrapped around rice and any number of other ingredients. If the rice is on the outside of the seaweed, it’s called an inside-out roll. Sushi chefs throughout the country have their own takes on what additions make a good roll. Some like to stick to more basic ingredients such as cucumber, avocado and sprouts, while others use more trendy ingredients like mango, cream cheese, macadamia nuts and jalapeno peppers. There are as many combinations as there are stars in the sky. Beginners take heart that most restaurants offer detailed descriptions of what’s in the maki on the menu. Look for ingredients that float your sushi boat and order away. The California roll is the gateway roll to all other sushi. It is made up of cooked real or fake crab, avocado and cucumber. 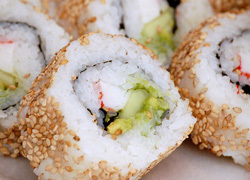 The outside of the roll is often sprinkled with tobiko (fish eggs) or sesame seeds. If you’re feeling brave enough to go raw, try the rainbow roll. It’s a California roll on steroids. It usually comes with seven types of sashimi wrapped around the outside, along with big slivers of avocado. This roll will allow you to try most of the raw offerings on the menu. Warning: it’s huge. Stay away from it if you are on a first date or have a really small mouth. Insider tip: Going with a large group gives you the opportunity to sample more exotic options while still allowing you the comfort of having your gateway roll nearby. Condiments — What’s that on my plate? Soy sauce — It’s not just for Chinese food. Pour some in a ramekin, mix in some wasabi (see below) and you have the perfect dip for sushi. I prefer the low-sodium version. Ask your server to bring it out of hiding if you prefer it too. Wasabi — The little green blob of paste you see on your plate, wasabi is the Japanese version of horseradish. Just the right amount adds a little kick to your roll. Too much will cause fist pounding, watery eyes and an intense burning in your sinuses. Insider tip: We almost never consume real wasabi in the U.S. Wasabi is costly because it’s so difficult to cultivate. Most sushi joints forgo forking over the dough and serve us a concoction of horseradish, mustard and food coloring instead. I feel robbed. Gari — This sweet, pickled ginger comes with every roll. Sometimes it’s white and sometimes it’s pink. Sometimes it’s in the shape of a flower. It’s the Japanese version of parsley. You’re supposed to eat it in between bites of sushi to cleanse the palate and aid in digestion. I like to leave it on the corner of my plate. It’s pretty. Insider tip: Most Westerners add a big fat dollop of wasabi to their bowl of soy sauce, stir it up and then dunk the sushi into the mixture like they would dunk a donut into a cup of coffee. 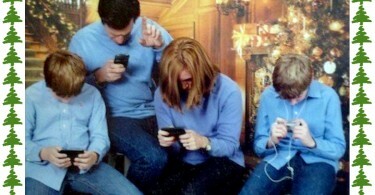 This is wrong! The correct way–pay attention, class–is to get a teensy weensy bit of wasabi with your chopsticks and delicately drop it on top of your piece of sushi. After this accomplishment, you should lightly dip the top of your piece of sushi into the dipping bowl. Letting it soak in the salty mixture is a no-no and is the equivalent of smothering filet mignon with steak sauce. Soggy sushi also has a tendency to fall apart before you get it to your mouth. So there you have it. Sushi does not have to be scary. There is life beyond the bento box. Take baby steps or dive in–the choice is yours. 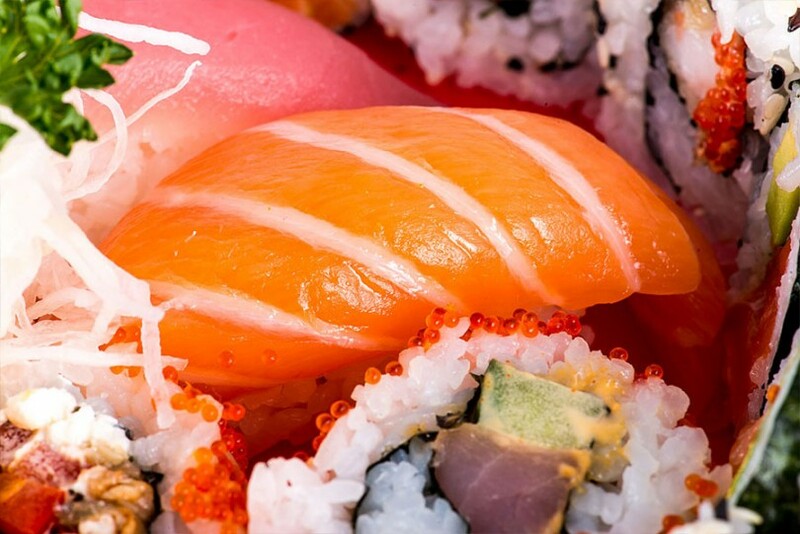 Eating sushi can be a divine experience. Grab some friends, summon your inner adventurer and go in search of your Sam-I-Am moment. Angela Schurhoff is a freelance writer and busy mother of two. Besides volunteering in the classroom, coordinating play dates and mother-daughter book clubs, shuttling kids between soccer and ballet lessons, and navigating through her recent divorce, Angela tries to find time to write. This Florida-born California transplant has recently returned to her writing career after a nine-year hiatus raising babies. She has written for the Sacramento News & Review and Citysearch.com. Some of Angela's future aspirations include hiking Machu Picchu, baking the perfect bundt cake, waking up feeling rested and writing a best-selling novel. She currently lives in the Bay Area with her two daughters.